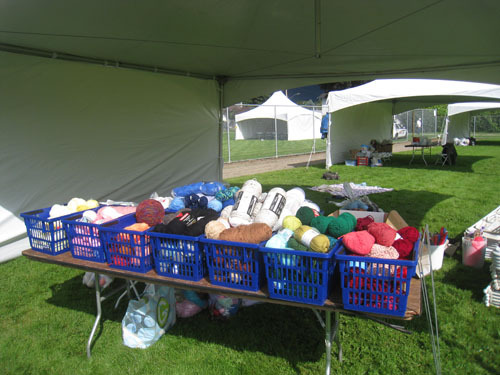 I had the good fortune to respond to a request for knitting teachers and ended up as a Core Staff member for the Girl Guides’ Spirit of Adventure Rendezvous (SOAR) 2011 last week. The position was volunteer and it wasn’t knitting, but I was thrilled nonetheless. I’ve missed working at camp with kids since getting a “career”. I learned that SOAR happens every 3 years, but skipped a year (2010) for the 100th anniversary of guiding in Canada while they had a country-wide celebration. 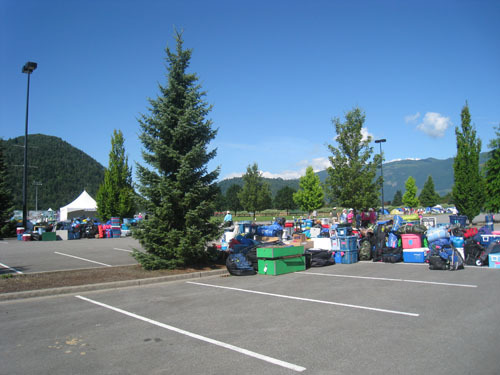 Resuming for 2011, the 6th annual SOAR was taking place in Agassiz, BC — a small town in the Fraser Valley near Harrison Hot Springs, approximately a two-hour drive from Vancouver. 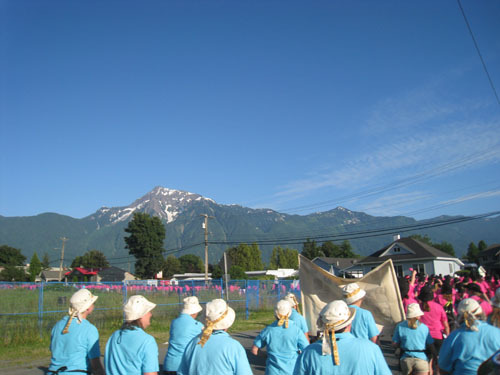 The opening parade through Agassiz, BC. Pink shirts are all the girls, blue are Core Staff. 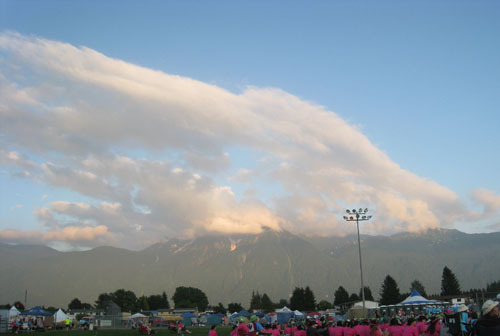 SOAR is organized by the BC council for Girl Guides, but is an international event with nearly 2,000 Girls, Guiders, and Staff gathering for a week-long adventure camp. 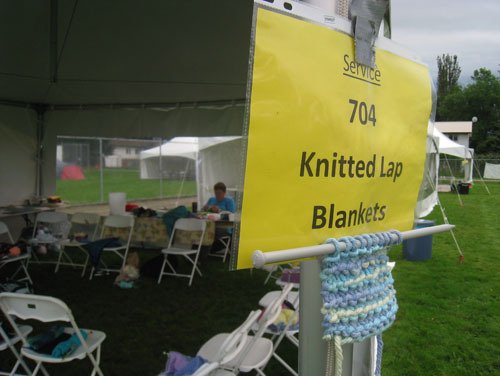 When I had responded to the call for knitters, the director informed me that the response had been overwhelming and they would love to have me help. When they later put a message out to volunteers asking for help with other projects, I responded with a list of my ‘talents’. I ended up being “recruited” as a non-Guiding volunteer member to help with card making as part of their Community Service Projects. 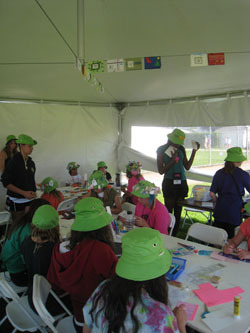 While at SOAR, each Girl has to put in 2.5 hours of Service to a community project. The Service director and the whole Service team was fantastic and I had such fun working with them. 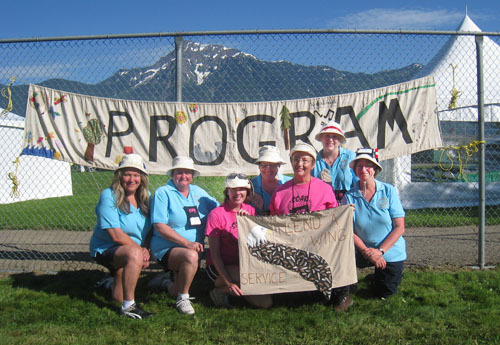 I arrived on the SOAR 2011 site in Agassiz a few days before the Girls arrived, and some of the Committee members had been there nearly a week already! 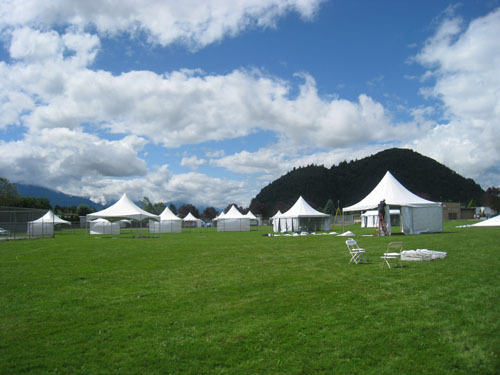 The giant marquees were going up and we began sorting through donations. Two of the other Service projects were knitting lap blankets for seniors and kids, and sewing fleece hats and scarves for the homeless. So the three of us were sorting through a lot of materials before the girls arrived. And I was floored by the generosity of the donators—boxes of stamps, new scrapbooking paper, stickers, die cuts, punches, edging scissors, and even entirely new scrapbooking kits. The sessions seemed to go really well, and often the Girls needed very little guidance, I just let their creativity take over. 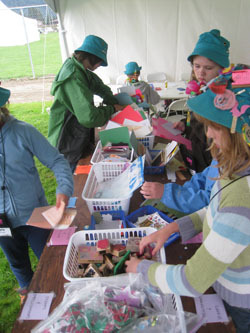 Each Girl got to make 2-4 cards, and one girl made 10 cards (she’d made cards with her mom before). I’ll upload photos of some of the cards to Flickr soon, but in total I’d estimate we made 700 cards. The all-occasion cards were being made for low-income families in the Fraser Valley and were meant to be blank and unsigned. Our Service team - Lend a Wing! All in all it was a fantastic event. It was a feel-good, warm and fuzzy week — working with kids, doing community services projects, volunteering, etc. The Service team and our director were also fun, friendly and made it that much more enjoyable.